Biceps are what most of the beginners come to build in the gym. And almost no one can do it. This all is because of the fact that in the performance of exercises and in the basic principles, many people make the same mistakes. First, it is perceived as one single muscle. But the double-headed flexor of the hand is a whole complex consisting of three heads: brachialis, a short head of biceps and a long head of the biceps. How to build properly a short one and why is it so important for the overall development of an athlete? How to build properly the short and long biceps, what these two heads are responsible for and where they are located, let’s consider the table. Short head of biceps Lift in peak amplitude, work at different angles Lifting on the Scottish bench. Working with the barbell and W-bar. Incorrect exercise. In this case, its efficiency decreases, and the load is evenly distributed between all the heads. Arnold’s cheating. 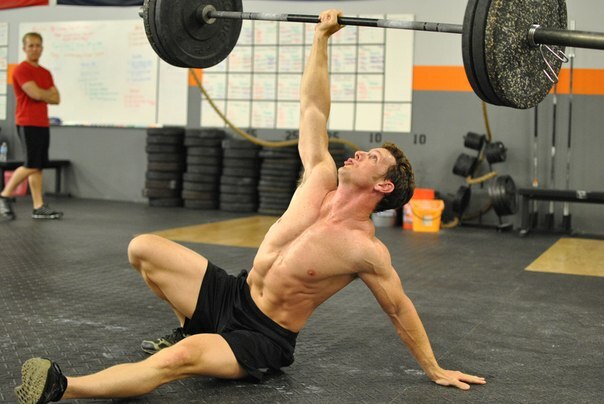 When throwing the barbell by the body, in a certain moment the hands are shifted significantly forward. That involves all three heads, with a greater emphasis on the short one. 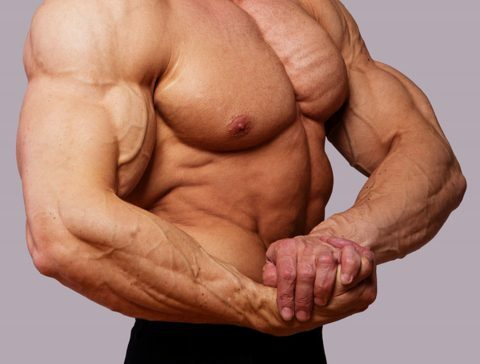 Usually, novice athletes try to keep the technique, so in the first months of training, the short head of biceps begins to lag behind, which is expressed in the impossibility of making further progress. Therefore, many instructors put in the basic program exercises on the Scott bench. How to work out a short head of biceps? With a concentration curl, there is no special accent, simply because of the specific position of the hands with respect to the usual amplitude, the long and the short head are worked out at different phases of the movement. Due to this – it is a complex, but, at the same time, single-joint exercise. How to perform a concentration curl? Take a small weight dumbbell (about 10 kg). Lean it against the knee in such a way that the hand is fixed below the elbow level. Fix at the top for 1-2 seconds. Slowly unbend it, not leading the movement to the end. This will save the load in the muscle group. 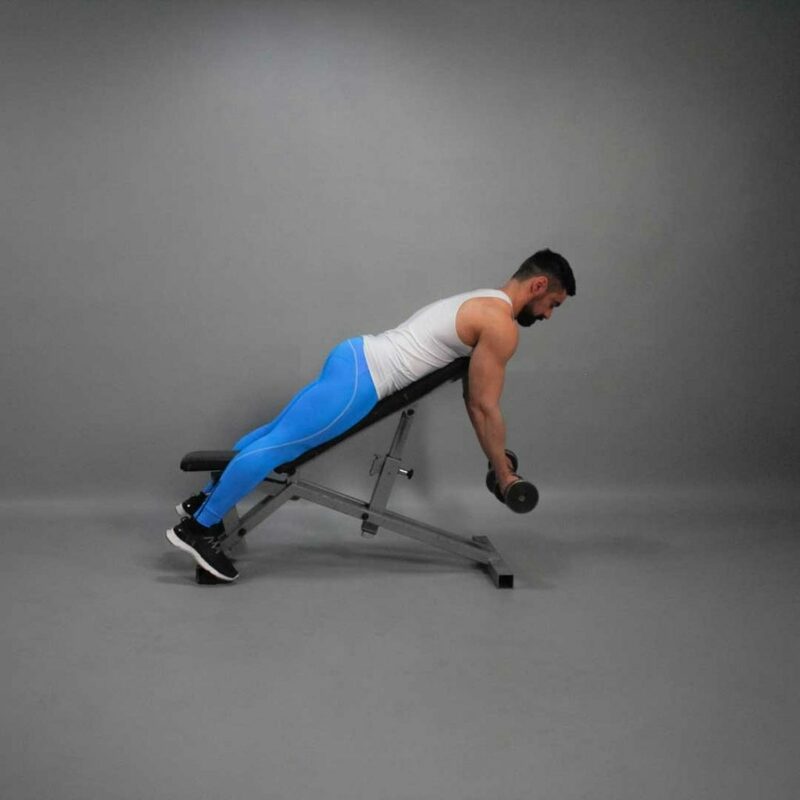 When you perform an incline curl lying face-down on the bench, your arms are positioned in front of your body and will stress the short head. Begin by lying face-down on a bench set at a 30-degree incline. Hold the dumbbells with your arms hanging down and aligned with your shoulders. Your palms should face away from your body. Exhale and slowly lift the weights up toward your shoulders, keeping your wrists straight. Inhale and return to starting position. Perform 10 to 12 reps for one to three sets. Avoid swinging your arms and using momentum to complete the curls. A curl performed with cables in which both arms are held to your sides can isolate the short heads of your biceps. Attach stirrups to the high pulleys of a cable crossover apparatus. Stand in the middle of the apparatus and grasp the handles, extending your arms out to your sides. Your body should form a T shape. Slowly bend your elbows and draw the handles toward the sides of your head. Squeeze your biceps at the top of the movement and then return to starting position. Perform one to three sets of 10 to 12 reps.
Set a light weight on the W-bar. Lean it against the Scott bench, so that the fixation is below the elbow level. Many people hope that depending on the grip (supination of the hand), you can focus the load on one or another head of the biceps. This is a myth, although it is partly true. If you perform incomplete supination of the wrist (the arms are spread relative to each other), then the long head eats most of the load, although the short one participates. And when working with a direct grip (palms look down), the load even falls on the other head, it is not possible to build it normally. Because most of the work is done by brachialis, and the rest is eaten by deltas (when lifting). 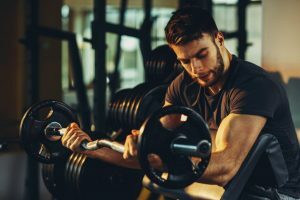 But most importantly, because of insufficient wrist force, it’s simply impossible to perform a large number of repetitions and to pump a lot of blood into the muscle group. 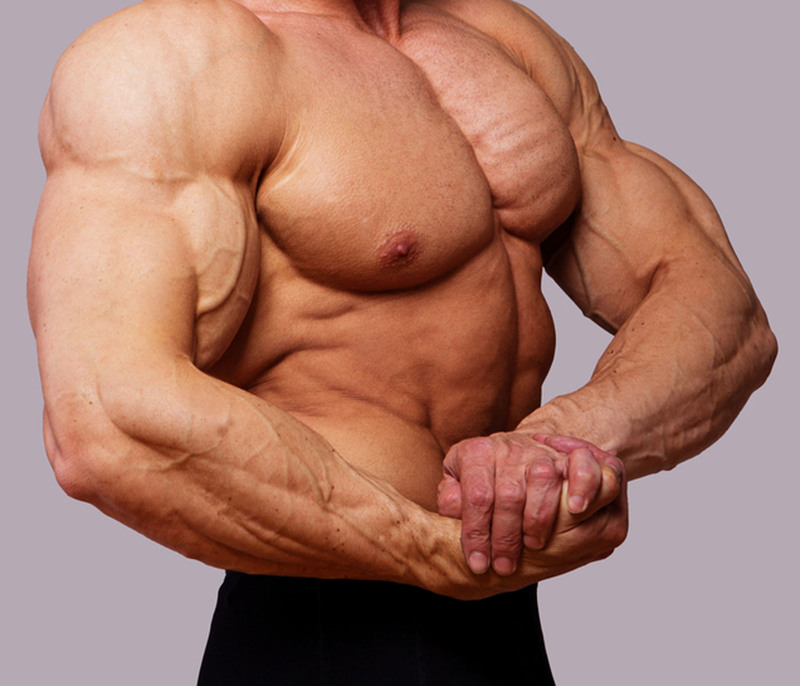 There are no specific contraindications to the training of the short head of biceps. There are only general, associated with the state of the vessels and joints. The main mistake in the technique of performing any bending is cheating, when work is performed either by deltas (due to lifting the dumbbell slightly in front of you). In this case, the jerk reduces the amplitude of the movement, which allows you to finish 1-last time. However, it is not recommended to use it constantly. The second mistake is the full extension of the elbow. Firstly, with full extension, the athlete encounters overcoming the stage of “30 degrees” when he needs to overcome ligament resistance, while the muscles themselves do not participate in this amplitude. This increases the wear and tear of joints and ligaments, and reduces the effectiveness of training. The growth of your muscle mass occurs throughout the body. This means that all attempts to develop powerful arms in isolation from the rest of the body will lead to nothing. The body will grow – arms will also grow. Priority of your training should be on basic exercises and large muscle groups – back, legs, and chest. Never stop improving your technique. Be able to feel the muscle contractions and know how to turn off the secondary muscles. Perform exercises with small weight (or even without weight), working out each centimeter of amplitude. Beginners often “kill” their muscles with too heavy load. Bicep in this case is already thinking not about how to grow, but about how not to die in training. One or two exercises on the biceps, 6-8 working approaches – this is the maximum for training for beginners. Observe the principle of progression of loads on each workout. Increase the working weight, the number of repetitions or approaches, reduce the amount of rest, but increase the intensity of the training. Arnold Schwarzenegger performed the barbell lifts on the biceps with a weight of 120 kg, which explains the size of his stunning biceps. Regardless of the programs and exercises used, remember that the short head of biceps can be built even without accenting on it with special exercises. It is enough to perform basic exercises that involve flexor muscles. In particular, remember the two titans, thanks to which your hands will turn into the real bazookas. 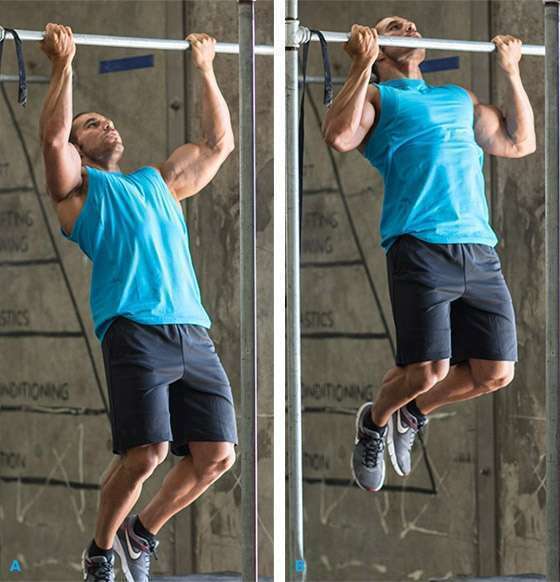 These are bent-over rowing with reverse grip and chin-ups. Without basic exercises, no matter how hard you try, your hands will remain in their infancy, even if you keep the perfect technique. And the rest of the exercises are completely optional. Well, if you’re still not sure which head is working out during the exercise. How to determine which head is working – the long or the short? Just tighten the biceps in idle. First, with a simple position of the wrist (towards you) – a common peak will be allocated, which usually lags behind in all, and this is what the performing athletes train and work out. And when you turn your hands with the palms on the contrary (from one another), then you will automatically see an exserted long head of the biceps.